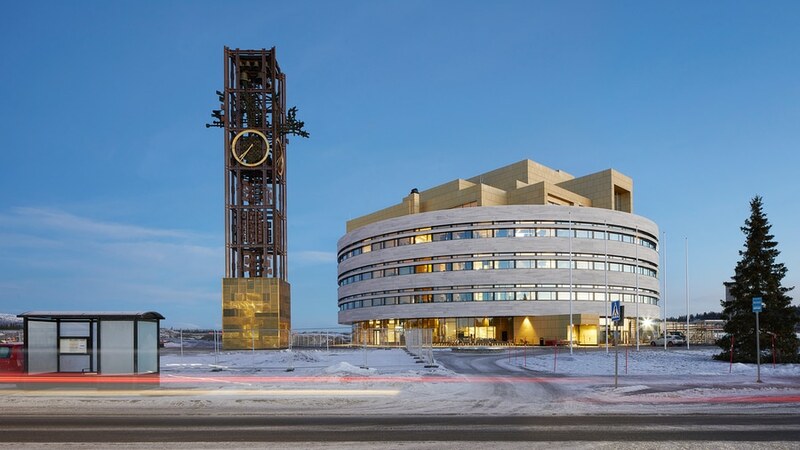 Kiruna’s new town hall is a tribute to the town’s history and a framework for emerging communities. 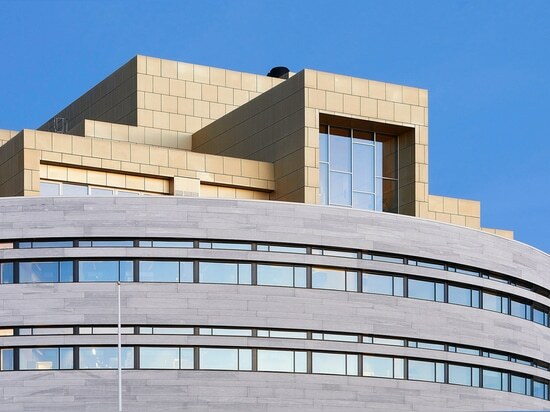 Named Kristallen, or “The Crystal,” the building draws physical inspiration from the angular geometry of iron minerals. Distinct inner and outer building volumes support the building’s dual roles of community and civic benefit. An inner core of these angular metallic volumes makes space for community functions: Public exhibition rooms, workshops and social common spaces ensure the building’s vital function as a community hub. 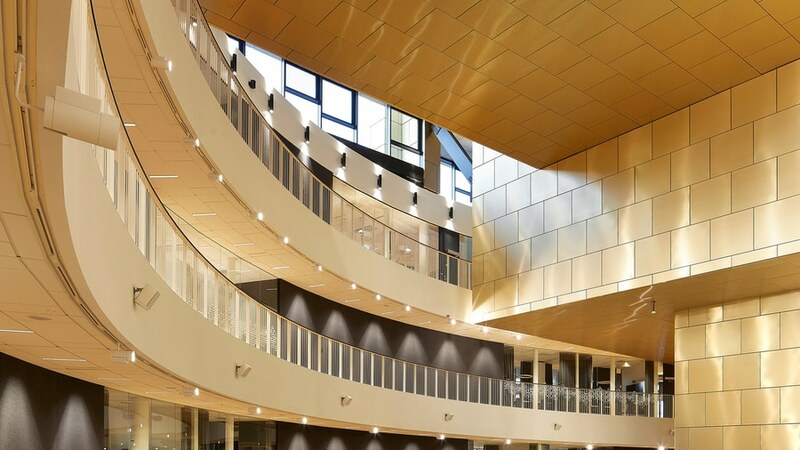 This central crystal allows the town hall to serve Kiruna beyond civic logistics and local governance – It is a space for old friends and longtime neighbors to meet within the new city center, supporting a sense of social unity during the transitory period of Kiruna’s relocation. The outer volume covers the inner metallic crystal with a sleek circular glass and natural stone façade. Housing staff offices for various municipality departments, this section houses the town hall’s civic function, but also contributes to the building’s functional design. 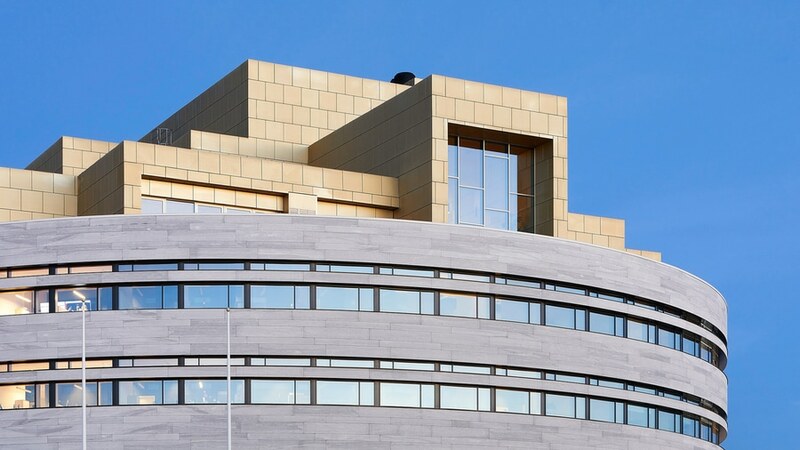 The circular exterior forces wind to move around the building, ensuring that the winter’s heavy snowdrifts will not settle against the façade. 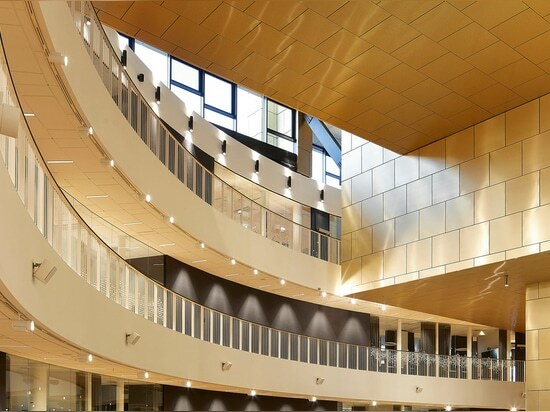 The circular form symbolizes unity and solidarity: Centrally located in the heart of new Kiruna, the building encourages equal access to all citizens. In the subarctic sunlight, The Crystal’s radiant white exterior establishes it as a visible landmark for a resilient community. 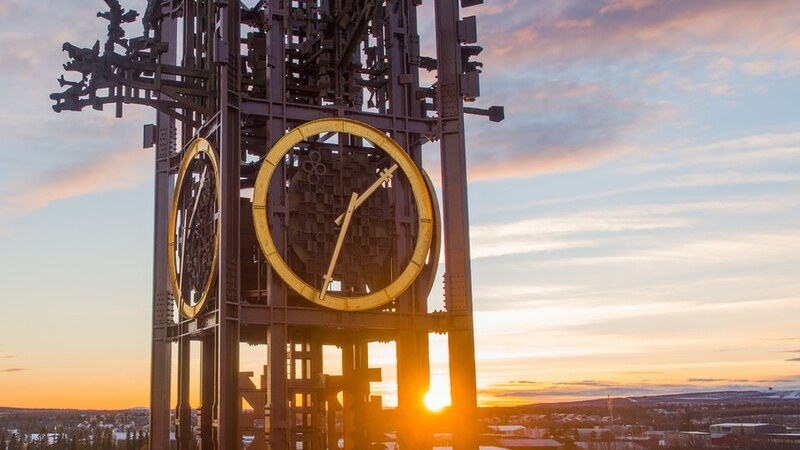 The Crystal is a continuation of Kiruna’s architectural heritage. The design includes the original bell tower and recycles building materials from the 1958 town hall, slated for demolition during the move. 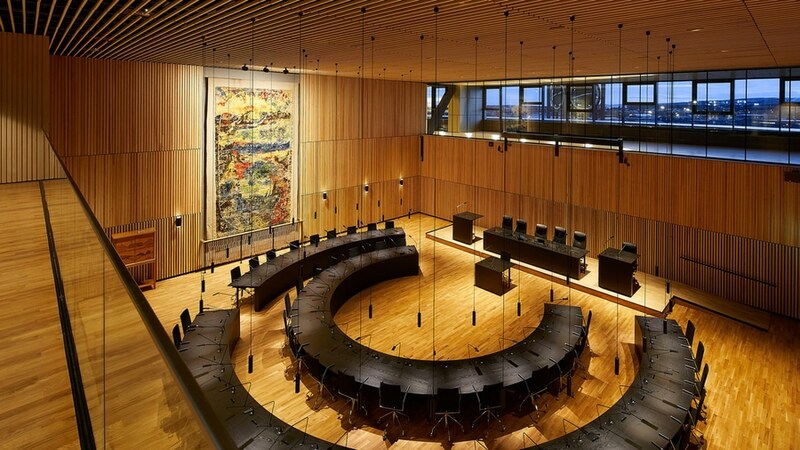 In this way, the new town hall represents not only a visual reimagining of the town, but a physical continuation of Kiruna’s history. The Crystal’s interior will be a hub of activity, an energetic and accessible forum supporting the interplay of local politics and community development. 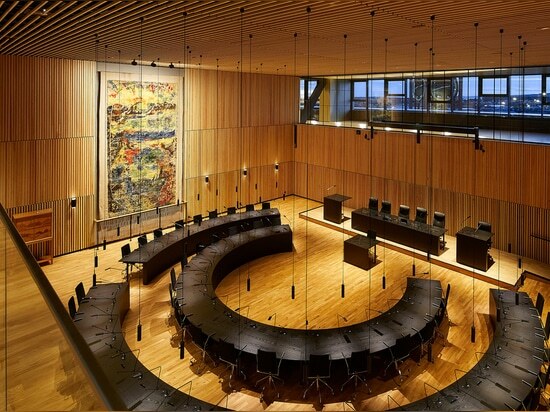 Opened on 22 November 2018 as the first major landmark of the relocated Kiruna, the town hall establishes an inviting gathering point for the town, standing as an enduring architectural illustration of Kiruna’s heritage. Each day, the Kiruna mine produces enough iron ore to build six Eiffel Towers. The mine provides 90 percent of Europe’s iron ore, having produced 950 million metric tons of ore since mining operations began in 1898. 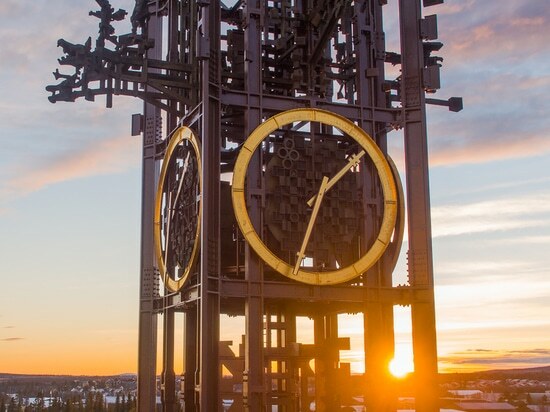 Kiruna was born as a mining town, emerging along the tracks of a new rail line that connected the immense iron deposit to the Norwegian trade harbor of Narvik. The town owes its existence to the management and financing of the Luossavaara-Kiirunavaara mining company (LKAB), which owns the mine and remains Kiruna’s largest employer. After over a century of constant operations, Kiruna continues to extract over 26 million tons of ore from the mine every year. The mine birthed Kiruna – And now, the mine threatens to erase it. More than a kilometer beneath the light of day, these operations are vital to the continued existence of the town itself. But on the surface, warning signs have begun to appear: The ground is breaking, splitting into deep rifts and falling into sinkholes. The extensive mining operations are causing surface-level subsidence, meaning that the earth above the tunnels is weakening and sinking downward. In response to this threat, mining firm LKAB has proposed a direct solution: Move the town. Since 2004, the company has planned to shift the town of 18,000 citizens some three kilometers east, outside of the projected spread of ground level subsidence. Perhaps simple in concept, the logistics of this operation are anything but. LKAB anticipates relocating 3,050 houses, in addition to nearly 200,000 square meters of commercial, office, school and civic floor space. LKAB has offered to purchase existing houses at 125% of market price, or pay for a new residence in the relocated Kiruna. LKAB, now state-owned, is footing the bill for this grand relocation: While an expected completion date of 2100 complicates final price estimates, the company has already allocated some 12 billion kronor, or $1.3 billion. The difficulties of this endeavor are larger than logistics and finances. 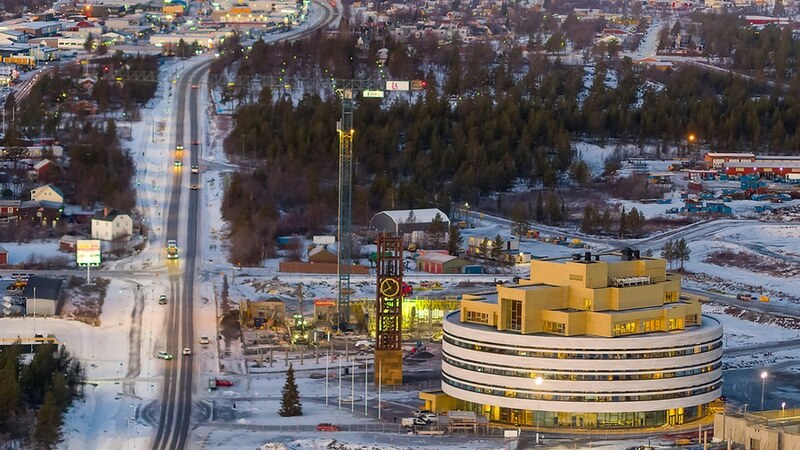 Demolishing the old Kiruna and moving residents to a fresh city uproots generations of local heritage, interrupting tight-knit neighborhoods and erasing multigenerational family stores. 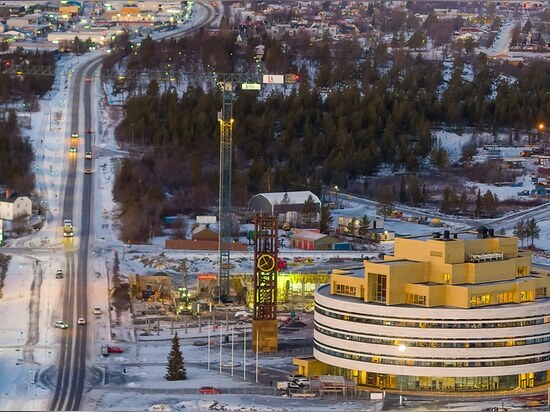 LKAB is preserving and relocating 21 buildings from old Kiruna, but the rest of the city will be built anew. This relocation is a challenge of identity – How does one preserve communities in a new space? Where is the balance between a fresh image and town heritage? Answering these questions spans city planning and personal histories, exploring the relationship between architecture and community. 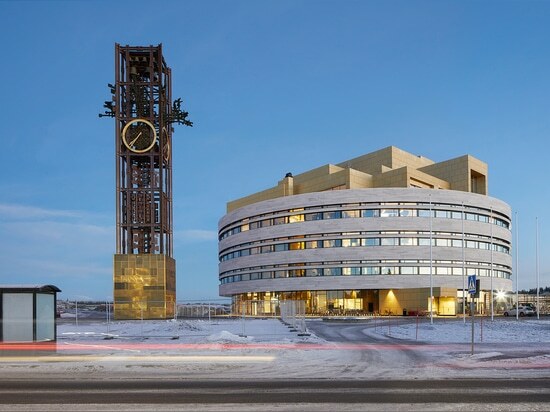 Henning Larsen is proud to contribute to this process with our design for the new Kiruna Town Hall, an architectural tribute to Kiruna’s heritage and a public focal point for a new community.